John Abraham to Launch Harshvardhan Rane in Bollywood. Anamika Promotion: Harshavardhan Rane Goes Missing. Harshavardhan Rane told IANS, "Nobody from the film's unit informed me about these posters. I was shocked to find them on the roads, at traffic signals and all over Hyderabad. But then I don't mind doing anything to promote my film. It has created a lot of curiosity among the audience. "Nayantara is reprising the role of Vidya in Anamika, which will feature Rane in the role of a husband gone missing. Harshavardhan Rane added, "Friends and relatives started calling me to find out if I was fine. The youngsters in the family quickly understood that it was all part of promotional strategy; the elders were not so quick to get it. I'm glad that it has caught the eyes of so many." For the recent festival of Sankranti, kites were sold with the missing photograph of the actor. The actor said, "A lot of my friends told me that they found kites flying with my picture during Sankranti in Hyderabad. I think it was a brilliant idea to promote on kites, especially during the festival." Asked if he feels Telugu industry lacks the expertise in promotions, he said, "Our films with stars absolutely need not worry about promotions because audiences are automatically drawn to cinemas because of their emotional connect with the stars. However, it's not the same in the case of smaller films." "In the last two years, smaller films have shown a lot of creativity in the promotional department. Promotions are very important for concept-based films because the concept becomes the creative part in them. I still remember the promotions for Telugu film D for Dopidi. It was fresh and innovative," he added. In D for Dopidi, about four unfit robbers, the lead cast, wore masks during the promotional tour of the film. Directed by Sekhar Kammula, Anamika also features Pasupathy and Vaibhav Reddy in important roles. Yesterday I shot in the sun for 12 hours and today another 12 hours. And for the first time for a movie, I have taken off my shirt,” rues Harshvardhan Rane. Is he doing a Salman Khan? “They all have a six-pack and mine is exactly 3.5pack. The director asked me to do some something drastic and I went on a diet, so I have a 3.5 pack now,” he laughs.After Avunu, Harshvardhan did not want to do something that would just increase the number of his films. He wanted to do something that would connect with the audience. 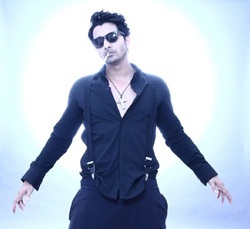 Harshvardhan Rane signs a three film deal. Telugu filmmaker Madhura Sreedhar has inked a three-film deal with actor Harshavardhan Rane of "Avunu" fame. All three Telugu films will be produced by the filmmaker under his home banner. "I have signed Harshavardhan Rane for a three-film deal. We are in the process of finalising the three films, and therefore, at the moment I can't reveal the names. But I can confirm that all the three films will be produced by me," Madhura Sreedhar told IANS. The story is about three different guys, and Harsh is one of the leads. Vitika is cast opposite him. Vishnu [ Images ] and Harish play the other roles“I play a rock star in the film. My character is called Randhir (Randy) and I’m also a coffee shop owner. These coffee shops are a big trend today and close to the youth. 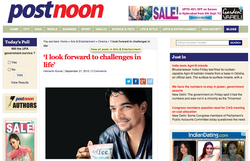 People are also into music, so the character is close to today’s youth,” says Harsh in this exclusive chat. Going by the recent success of the supernatural thriller 'AVUNU', Harsha seems to be setting a new high for the Telugu Film Industry. His latest hit 'AVUNU' has grossed over 12+ crores and is fast racing towards becoming a blockbuster hit. The film released initially in 60 theatres, and by the 3rd week has almost doubled the number of screens. Harsha’s convincing portrayal, as the possessed lover has received several accolades from Bollywood filmmakers as well. The film is soon to be remade in Hindi with Anushka Sharma and is rumored that the filmmakers are keen on working with Harsha in the Hindi version. Karthik, the director of 'INFINITY' a short film produced by Harsha is also expected to start his full-length feature film soon. 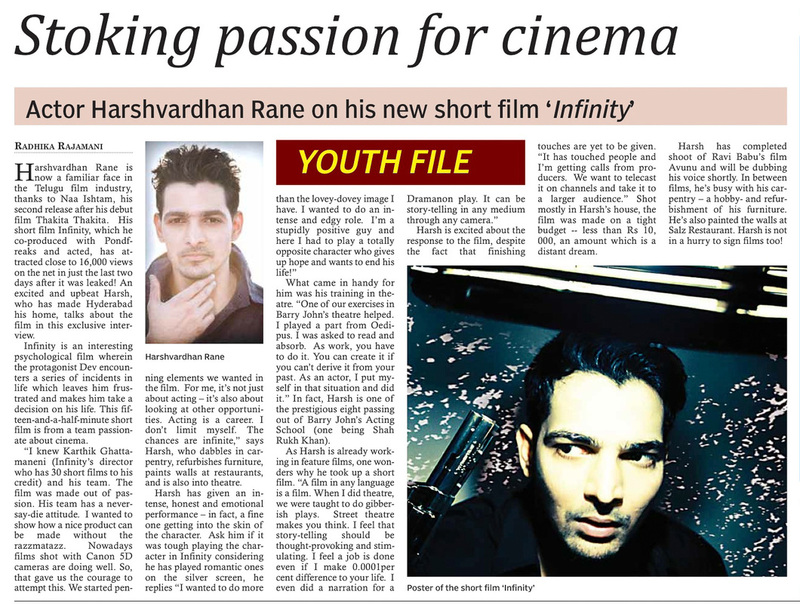 'INFINITY' was a trendsetter in the short film genre and established Harsha as an actor/producer who shouldered both responsibilities with total dedication and complete passion. With Karthik's graduation to a full-length film now, Harsha is fast turning out to be a lucky mascot for films that chill to thrill. Playing the possessed lover seems to be proving lucky for actor Harshvardhan Rane, who is basking in the success of his recent release Avunu. Made on a shoestring budget, the film has gone on to be a sleeper hit. "This is easily the biggest hit of my three-film career. I am pretty excited for having managed to turn the tide. I am now flooded with offers, I've read more scripts in the last four weeks since the film's release than I did in all my life," he says. Although Avunu brought him the recognition he wanted, the actor isn't too keen on doing a horror film again. "Well I am scared of watching horror films. I couldn't sleep for years near a wall after I saw Raat. So I don't see spooky movies. But funnily enough, I just seem to be getting a lot of scary movie offers these days. But I just want to collaborate with passionate filmmakers and want to be there for new filmmakers who want to try experimental stuff like Infinity," he says. Harshvardhan Rane talks about working with director Ravi Babu, his next outing Avunu, which is a horror movie, and much more. There’s a certain amount of quirk in almost every Ravi Babu’s film. His latest film Avunu is no different. The film, starring Harshvardhan Rane and Poorna, narrates the story of a couple who begin to witness strange incidents in their house after they move to a new neighbourhood. 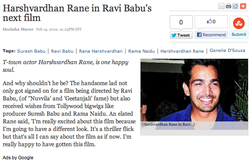 Harshvardhan Rane, who was last seen in Naa Ishtam, can’t stop raving about Ravi Babu. Fear is the central theme in Avunu. Unlike most other horror films which rely too much on camera movements and sounds, Ravi Babu took a completely different approach to shoot Avunu. “Ravi Babu told me that he was casting me because I was a theatre actor. Avunu is a unique film in this genre because Ravi Babu wanted to keep the camera static and he never used any of the conventional techniques. There’s so much scope to perform under such circumstances because it’s almost like a play,” Harshavardhan says. So could he relate to the theme of the film? “I am not a big fan of horror films either. It took me seven years to get over the experience of watching Raat,” he recalls and assuring us that there’s no monster in the film. So what is it that the protagonists in the film are afraid of? “There’s no face to the fear in our film. But when people watch the film, I am sure they can relate this fear to some incidents which might have occurred in their life. You can feel it everywhere around you. It may not harm you, but the idea that someone is watching you when you are alone is itself quite spooky,” he adds. The film was inspired from a real incident which Yami Gautam had narrated to Ravi Babu during the shooting of Nuvvila. Ravi Babu has been going gaga over Poorna, who’s playing Harshavardhan’s wife in the film. After making her debut in Seema Tapakai last year, Avunu might very well turn out to be her breakthrough film in Telugu. “Poorna is the best part about the film. She’s very sharp and one of the most mentally strong people I have ever met,” he confesses. Harshvardhan Rane goes to Bollywood. 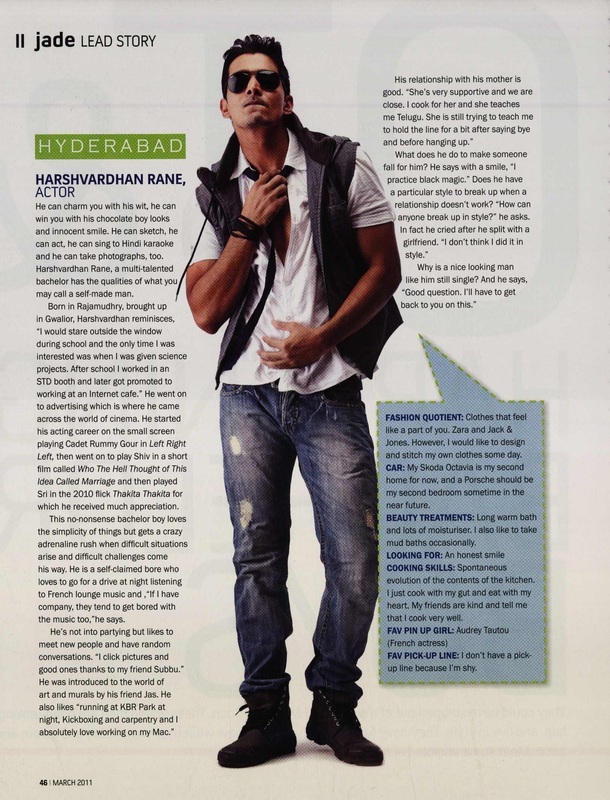 Harshvardhan Rane in Ravi Babu's next. 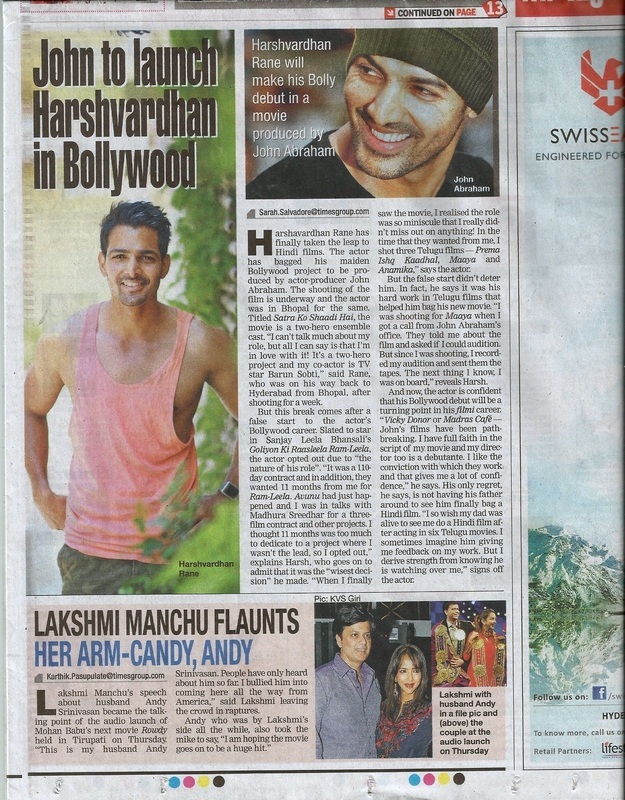 Harshvardhan Rane Produces and acts in a Short Film. Harshvardhan Rane speaks about his passion for cinema. 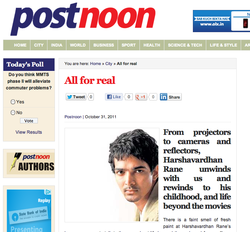 Harshavardhan Rane unwinds with Postnoon and rewinds to his childhood, and life beyond the movies. From projectors to cameras and reflectors, Harshavardhan Rane unwinds with us and rewinds to his childhood, and life beyond the moviesThere is a faint smell of fresh paint at Harshavardhan Rane’s house as we go to talk to the man about life beyond the reels and frames. “I am working on this table to give it an antique look”, he says, looking at it pensively. And the French lounge music playing in the background if anything, adds more intensity to his expression. Harshavardhan was born in Rajahmundry and brought up in Gwalior. His father, Vivek Rane was a doctor and his grandfather, an army lieutenant. His mother is a homemaker settled in Hyderabad, and his sister, Rohini lives in Mumbai. As a child, Harsha had a mammoth love for music. It is evident when he says, “I used to sneak out of my house to meet the neighbourhood annas to listen to music! I was never attracted to alcohol or cigarettes — it was music all the way. It was a like a barter. I did their engineering drawings, and they let me listen to music,” he reminisces. Harsha joined the Bhagat Singh College in Delhi to pursue a course, but later joined worked as a freelancer in a film-branding enterprise. “I wanted to be in the movies badly, so I worked hard to get there. With my first salary, I gifted my dad a Nokia 3310, and he was overwhelmed,” recalls Harsha. He then moved on to Mumbai, where he got his first opportunity in the serial Left Right Left on Sab TV. Tollywood actor Harshvardhan Rane, known for his role as Sri in " ThakitaThakita" with Bhoomika Chawla, and actress Deeksha Seth, known for her role as Pooja in the Allu Arjun film "Vedam", have something more in common than just films and being part of Tollywood. The two share a common interest in carpentry. The two recently paired up to make the actress a book shelf. 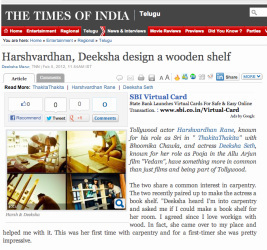 "Deeksha heard I'm into carpentry and asked me if I could make a book shelf for her room. I agreed since I love workign with wood. In fact, she came over to my place and helped me with it. This was her first time with carpentry and for a first-timer she was pretty impressive. It was a very basic one, and we had a blast working on it" said the actor. Ask him what he's upto when he's not doing anything related to films, Harsh is busy experimenting with wood and design like making shelves and CD racks. 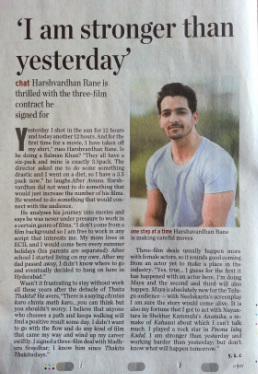 Harshvardhan Rane shares his experience about Thakita Thakita (2010). Harshvardhan (Harsh) Rane was a popular face in the Hindi serial Left Right Left on Sab TV a while ago. Recently he was seen in the play A Streetcar Named Desire. Trained by theatre director and teacher Barry John, Harsh has been involved with theatre for about two years. 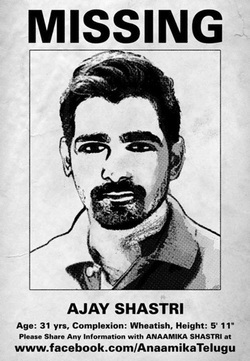 He grew up in Gwalior and later worked with an ad firm in Delhi before shifting to Mumbai to pursue his dream of acting. Harsh's first feature film in Telugu Thakita Thakita (produced by yoga guru Bharat Thakur and actor Bhumika Chawla) is up for release this Friday. Harsh unwinds the whole experience of acting in Thakita Thakita. You did a Hindi serial Left Right Left on television. How did you land up in a Telugu film Thakita Thakita? I was born in Rajahmundry (Andhra Pradesh). I did theatre in Mumbai after being trained by Barry John. I had gone to meet Abbas Tyrewala at his office but I entered the wrong room where director Srihari Nanu and another person were auditioning. They asked me if I would be interested in audition. I didn't think twice and gave the audition. Bharat Sir (Thakur) saw the video of the audition and recognised me as he had seen me in a play. We met and then after two months, he called me to sign the film. Thakita Thakita is your maiden feature film. How did you prepare for it? Bharat sir got all of us (boys and girls) to Hyderabad into an empty bungalow which was subsequently furnished. The five of us (four girls and Harsh, Trinethrudu was a local person) stayed there and that's how our journey began. We would wake up at 6 am, jog, do yoga for about two hours and then have breakfast. Bharat sir planned our diet. I was very beefy so I had to tone down. Then there were Telugu classes for two hours. After lunch, we were shown Telugu films followed by acting workshops and dance classes. The day would end by 9.30-10 pm. How long did this regimen continue? For 6 months. The dance classes helped me as I didn't know how to dance. We started shooting scenes on a high definition camera (on the weekends). Bharat sir would oversee all of this. It was like a complete academy. I had never gone through this regimen even though I had done acting classes with Barry John. After six months of rigorous training, Bharat sir gave the green signal to start shooting. I am grateful to Bharat sir because of his vision and foresight and for believing in a newcomer like me. He polished me. Is the cast chosen from different parts of India? Yes, the cast is from Mumbai, Delhi and even London. Bharat sir has yoga centres all over the country. Some of those selected initially for training were replaced because Bharat sir was particular about the look. When I heard the script in English, I couldn't stop laughing as there was situational comedy. There was a message as well. It was like Bharat sir's role and his style of teaching. You will have fun and also realise there is a message. Was learning Telugu easy or difficult? I don't know. I'm half Telugu. My mom is Telugu and dad, a Maharashtrian. I was brought up in Gwalior. I was exposed to English, Hindi and Marathi. I heard my mom speak to her family in Telugu so I got the hang of it. Also I loved putharekhalu (a typical Andhra sweet), rasam, lemon rice and murukkus (savoury dish). You are the lead protagonist. What is your role in the film? I play Sri, a naughty college guy who lies a lot and does wrong things. When people get into trouble, he too gets into trouble. But he has his own principles and beliefs which he never breaks and that makes the difference. He's a fun-loving brilliant guy. Nagarjuna and Anushka play themselves in the film, while Bhumika also has a role. How was it working with them? Were you in awe of them? When I was a child, I got an opportunity to see all the big players in a cricket match. I was a ball boy outside the boundary line. I picked the ball and waited a bit for Sachin Tendulkar to come near me to give it to him. The sense of being in the same space was special. While thousands were watching, I was close to Sachin. It was the same with Nagarjuna sir. When he stood next to me, I couldn't believe it. I had watched his films and mom used to love Shiva. When I looked at him, he was the same as he was in Shiva. He was not bothered about his looks. I hope I can get one per cent of his charm. It was unbelievable. I saw him for a whole day. He never went to the vanity van to rest. That was a huge lesson I learnt and I hope to put into practice in future. We hear of stars and tantrums, but he was so simple. It was a once-in-a-lifetime experience for me. Anushka plays a superstar and in the film we get to meet her. She's part of Bharat Thakur's family. She would come to the workshops and give us tips. We felt at home with her. Bhumika plays a teacher. In a way, she changes the approach of the youngsters. I still can't believe she's my producer. She stopped shoot once and offered food from home. I made excuses all the time and ate her food! She has been a pillar. What's been the experience of acting in this film? It's been a huge lesson in my life. I lost my dad during this period. It was shocking as he was a healthy man. After I returned, Bharat sir and all rescheduled my scenes whereby I did all the sad scenes first. They extended so much of support. Bharat sir would say smile and enjoy the pain. I learnt that and it helped me to cope with my dad's death. These two years have been like being in a school. The only thing in my life now is to sleep peacefully and wake up with a smile on my face. I am not a religious person but I have grown spiritually with this film. Are you nervous or jittery about the release? I am looking forward to it. Somewhere I have completed my journey, so the result wouldn't affect me. Would you like to work in Telugu films? Have you signed any project? I would like to work in Telugu films. I got a lot of offers even while shooting Thakita Thakita. I know what not to do. I want to wait and get the hang of the industry, and be more mature before signing films. You recently acted in a play A Street Car Named Desire (with Bhumika) which was staged in Hyderabad. How was the experience of doing that play? That was totally awesome. Seema Azharuddin and Shrikant Iyengar got Broadway to India. They made it so huge that they kept me in a five-star hotel for 3 months. I got to concentrate on one character and could play around with the lines. It was the best arena I could get. Would you want to juggle theatre and films? I would do theatre till I die. Theatre keeps your honesty alive. You can't pollute yourself. You learn a lot and you use theatre techniques in life. I have learnt three things from Barry John which are applicable to life too: Don't expect anything from another actor, one shouldn't judge and one shouldn't block things.